With great pleasure I would like to introduce The Coffee Quest's new project in Matas de Minas in Brazil. By initiative of the younger generation we are embarking in a new project focused on specialty coffee from famous region of Minas Gerais. Last year we came into contact with Juan Vargas from Fazendas Klem, after commenting on some of the beautiful pictures on Instagram. Over the course of many conversations he introduced me to the work they are doing to lift the quality on their farms, as well as setting the example locally to start producing organically. Equipped with a new mind-set, the new generation of farmers realizes that a step-by-step change to producing better quality can offer a better alternative to provide in their future livelihoods. As The Coffee Quest we aim to provide a stable market for these higher quality coffees. The combined objective of all participants in the project to grow together and reach out directly to roasters on the market side. As world’s largest producing country you can say that the consumers drinking preferences have evolved side-by-side with global production. The lower altitude coffee from this colorful country gives out heavy dark chocolate and nutty flavors. However, with the market in Europe becoming more quality-oriented, the demand for complex coffee grows. Our intention is to target roasters interested in buying brighter Brazil’s with new flavors, while keeping part of the original profile that people love.Producers in the Matas de Minas are used to selling there volumes to local traders who take this to export market in Varginha, on the other side of Minas Gerais. Our intention is to develop a transparent market and stimulate the production of quality beans. The new '17 harvest samples are promising, as we now offer a range of washed, honey, semi-washed and natural lots, including some amazing micro lots and well selected Organic Certified coffees. Upcoming November will be the arrival of our first container from Brazil. The Coffee Quest is inviting you to get Direct! samples to find the perfect Brazil for you. Please contact us at we@thecoffeequest.com to discuss the possibilities of becoming more involved and create a direct relationship that will assure you great quality with continuity for upcoming years. Fazendas Klem is the lead on the Matas de Minas project and an example for Organic production in the region. After extensive studies into Organic processing, soil protection and many other variables, they have formulated a method for themselves using local materials grow their coffee. This constitutes the use of every organic material available, but also using minerals found nearby at large rock formations. Only a few years ago they have decided to start exporting themselves and providing technical assistance to others in the region. Step-by-step they are spreading the best practices from there own path towards becoming fully organic. As second crop they have planted trees that produce small avocados, making use of the same soils and certifications given. The Klem estate is USDA Organic, Rainforest Alliance and UTZ certified. The full estate is divided over several areas, all of which are farmed by the Klem family (existing out of five brothers) and several other families. The founder and grandfather Nagype Klem still works on the main section of the farm, next to where they are roasting samples and cupping all of the coffees throughout the season. 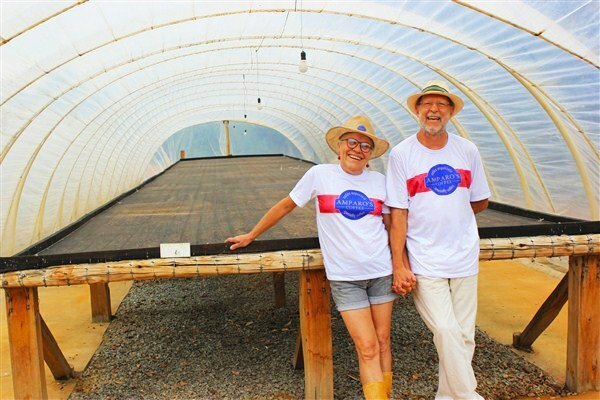 The initiative from Fazendas Klem has been piloted in 2015 on Amparo’s farm Flor do Bagaço in Lajinha, Minas Gerais. The small farm is unique in the sense that they practice full control over the post-harvest process, and that the farm is transitioning into becoming fully Organic. A simple set-up of wet equipment allows them to produce Washed, Honey and Natural coffee. The Amparo team uses hand-picking to take the best out of the limited amount of coffee area (unlike most of Brazil!). Each year Amparo works with the same people and treat them as best as possible. Working alongside them, training them in the selection of cherries. After harvesting the cherries, the process undergoes several stages of selection. Both during the wet milling process, but also on the tables in their Solar dryer (open greenhouse), and for the final product. Amparo’s dream to have people drink her quality coffee is becoming a reality. Both locally in Brazil, and now this season in Europe we will have the opportunity to deliver her coffee. The balance was made up of the farm's existing sections. Identifying the different growing altitudes, plant varieties, plant age, application of shade etc. The analysed variables allowed for a tailored approach to determining which post-harvest process to apply to each lot. The coffee is given a Natural, Pulped Natural or Fully Washed process, thereby differentiating methods in fermentation and drying. During the 2016 &2017 harvest seasons training's were given to the coffee pickers, with the objective to teach them what the ideal point of maturity is for all the chosen post-harvest processes. After harvesting the cherries the complex work is initiated of the wet processing & drying of the coffee. Drying is considered an essential aspect, giving the possibility to play with the different flavors in the coffee. All of the coffee is extensively cupped to determine it's characteristics, slowly establishing a guideline on how quality is influenced throughout each of the post-harvest processes. Cleaning, removing the husk and separating the different bean sizes if necessary. Micro lots are packed in vacuum bags and other interesting coffee is kept separated stored in GrainPro to protect shelf life. Each harvest season is a challenge to reach the goal of maximum quality. Playing with each process through dedication and enthusiasm. Always curious on how the coffee will be at the end of the season, and see what final price of export can be achieved. Fazendas Klem is stimulating participants to improve their learning curve by participating in national & international coffee fairs, sharing the experiences with other producers. This has also resulted in others visiting the project's farms to empower them to produce specialty coffee. The step towards quality is a step towards a future for Brazilian smallholders wanting to exist in the changing market.